An update for NavPac 4 is available as of 2018 May 9th. This page provides a focus for information, issues, updates and bug fixes relating to NavPac, HMNAO's celestial navigation software package for the PC under the Microsoft Windows™ operating system. 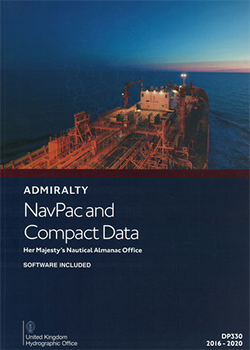 NavPac version 3.4.0 is supplied on the CD found in the Admiralty publication NavPac and Compact Data 2016-2020. We strongly encourage anyone using this version to upgrade to the much improved version 4.0.12. NavPac enables navigators to compute their position at sea using celestial navigation, and also contains features such as calculating great circle and rhumb line tracks. There are also functions for calculating rise and set times and determining the altitude and azimuths of navigational objects. Click here for a tour of the features of NavPac. A full manual is included on the CD which also includes part of the Royal Navy's Admiralty Manual of Navigation (Volume 2). Additional astronomical data files are also found on the CD, which can be read into any computer. Astronomers, navigators, surveyors and general users will find these data files ideal for making their own astronomical calculations where positions of the Sun, Moon, planets and bright stars are required. NavPac is used world-wide by the Royal Navy, other navies and by navigators who require an independent means of navigation. NavPac has also been accepted by the UK Government as a permitted system for naval certificates of competency under STCW95 (Standards of Training, Certification and Watchkeeping). HMNAO encourages all users of NavPac to register their software. All copies of NavPac and Compact Data 2016-2020 have been issued with a serial number. You can add or remove the registration of your copy of the software by providing your e-mail address and serial number which will allow HMNAO to advise you of updates and bug fixes to the software as and when they become available. HMNAO have recently redeveloped NavPac and the latest version is NavPac 4.0.12. This is available as a free download to those users who have already purchased NavPac and Compact Data 2016-2020. Users simply have to register their copy of the current version of NavPac using the serial number found on the back page of NavPac and Compact Data 2016-2020. This can be done here. If you have registered your copy of the NavPac software in NavPac and Compact Data 2016-2020, you can then download the new version of NavPac (4.0.12) from here. Please note that downloading and installing the new version will not affect your ability to continue using your current version as the two can be run simultaneously. We do however recommend using the new version due to its improved interface and functionality. Once the user has successfully installed NavPac 4 and registered it with HMNAO, the user must apply any patches containing bug fixes or updates released by HMNAO to ensure the latest version is installed. The patch file contains the accumulated updates currently available for NavPac 4. If you have any problems with the NavPac 4 software or wish to report an error, please e-mail HMNAO or use the Feedback page. A patch is available for NavPac 4 which makes the following changes. Fixes a bug that causes NavPac 4 to go unresponsive when transferring high latitude values into certain functions. Updates a constant to calculate GHA Aries. Fixes a typo in the closing warning message. Instructions for patching are available in pdf format. Registered users of NavPac 4 should follow this link to download the patch.